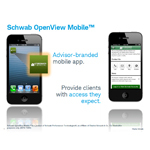 "The app is another way Schwab and SPT help advisors remain competitive by using technology to support the client experience"
SAN FRANCISCO--(BUSINESS WIRE)--After a successful pilot, Schwab Performance Technologies® (SPT) announced today the roll out of Schwab OpenView Mobile, a customizable app that RIAs can use to create a turnkey, branded mobile presence for their firms, enabling 24/7 connection with clients. SPT will work with participating firms to create the firm-branded app and each firm will then submit their app to Google Play and iTunes App Stores. 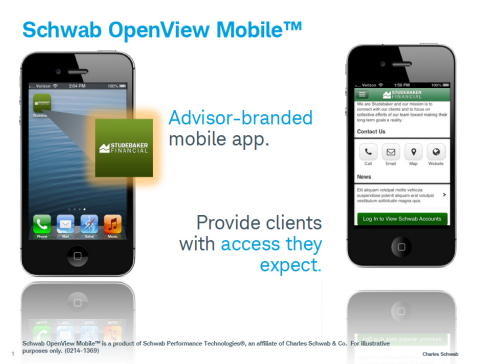 Schwab OpenView Mobile was first announced at IMPACT 2013, where Hathi identified mobile, cloud-computing, big data and integration as four key trends that will drive the success of an advisor’s business in the future. “Technology is playing an increasingly important role in helping advisors scale their business, enhance the experience of their clients and differentiate their brand,” said Hathi. According to Schwab’s 2013 RIA Benchmarking Study, 73% of advisors currently invest or plan to invest in mobile technologies, and the most recent Schwab Independent Advisor Outlook Study found that seven in ten advisors are focusing on differentiating their firm to stand out from the pack. SPT will work with advisors to customize their app to reflect their own brand, including adding their firm logo, contact details and choosing icons and colors. 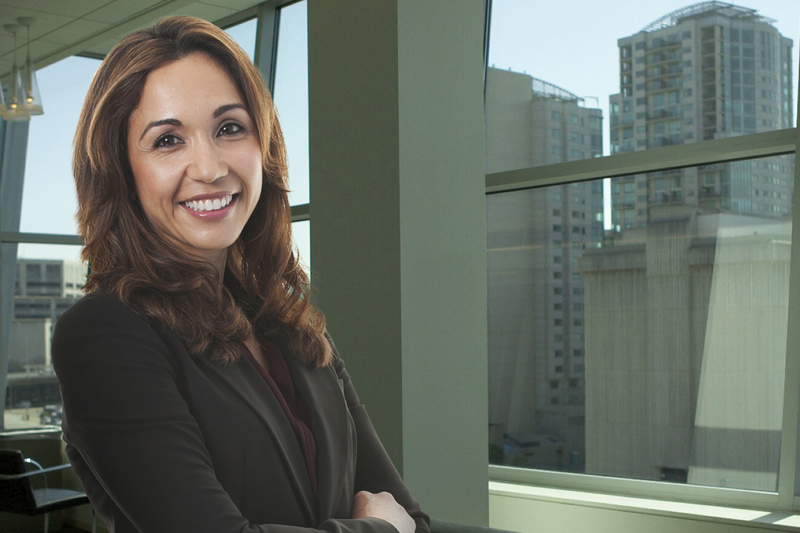 Once the app has been customized, the advisor will post it on Google Play and iTunes App Stores where their clients can find it by searching for the firm’s name. An RIA can customize the experience they want to create for their clients by including advisor news, promotional content, contact information and a website link, as well as real-time data on their Schwab accounts. Schwab Performance Technologies (SPT) provides technology and related products. Charles Schwab & Co., Inc. (Schwab) and SPT are affiliated as separate subsidiaries of The Charles Schwab Corporation, but their respective products and services are independent of each other.